If you’ve read our New Jersey Christmas Lights Displays you know how much we love seeing Christmas lights. We know you feel the same. 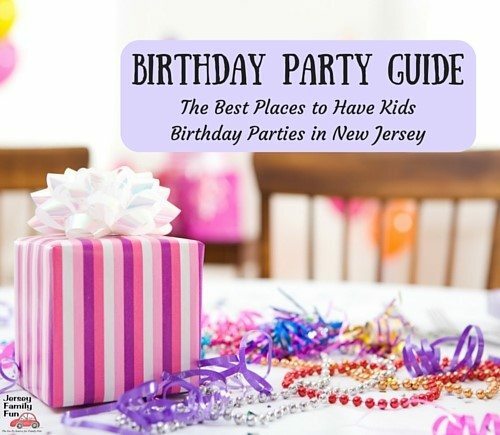 Our guide to New Jersey holiday lights is one of our most popular Christmas articles. We love Christmas lights so much that this year we wanted to bring you a new way to see them. As luck would have it, this holiday season we have 3 fun ways for you to see holiday lights. You won’t even need to leave your house to see these Christmas lights. So get comfy in your favorite spot and take a look. New Jersey does everything big including Christmas lights. Every Friday night between Thanksgiving and Christmas we’re going live on Facebook to show you holiday lights across our area. 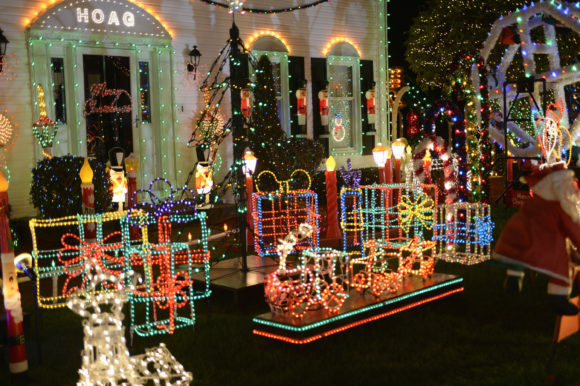 We’ll be providing you with a tour of one of our favorite places to see Christmas lights in New Jersey, once, twice or maybe even three times in a night. The tunnel of lights at the end of the Christmas Light Show at Skylands Stadium. Those same Christmas Lights videos will also be uploaded to YouTube. You can view watch below in a special New Jersey Christmas Lights Playlist. Make sure you turn on notifications or subscribe to get notified when we go live with our next video. Think of it as our version of The Great Christmas Light Fight. Speaking of The Great Christmas Light Fight, the show is back as part of ABC’s 25 Days of Christmas. Next to being there in person this is one of our favorite ways to watch Christmas lights. Season 6 of The Great Christmas Light Fight showcases the wildest and most spectacular Christmas displays in America. In each one-hour episode, four families from all around the country decorate their homes to the extreme in the hopes of winning the coveted Light Fight trophy and a $50,000 prize, with a total of $300,000 given away for the season. This season, as the temperature cools down, the competition heats up when families invite us inside their homes to witness their fantastic Christmas décor for the very first time. In addition to all of the stunning inside/outside displays, the first-ever “Heavyweights” episodes showcase light shows that have grown too large for any home. 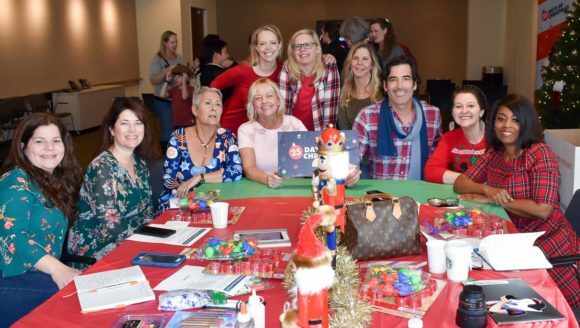 Carter Oosterhouse, judge and host on The Great Christmas Light Fight shares what he looks for in a house when judging. To judge the houses Carter has the criteria of design aesthetics, balance, creativity, uniqueness, and also experience. Carter used to decorate his home with holiday lights. He stopped after becoming a judge for The Great Christmas Light Fight. Now he focuses on holiday decor he creates himself. He said, “I started with lights on the house, and then I got on the show, and I stopped. It’s hard to compete, it’s hard to compete with these people. So for me, the baby, my wife, it’s so much easier to do DIY, smaller crafts, like, more manageable moments, opposed to just trying to beat the neighbor, which is essentially trying to beat all of the people that I see on the show. His go-to Christmas craft with his 2 year old daughter is to decorate pinecones by dipping them into white glue and glitter. Then they string them together to create garland. The Great Christmas Light Fight is shot a year in advance. This year’s episodes are based on houses they filmed last year. This year’s filming will be the 2019 The Great Christmas Light Fight episodes. 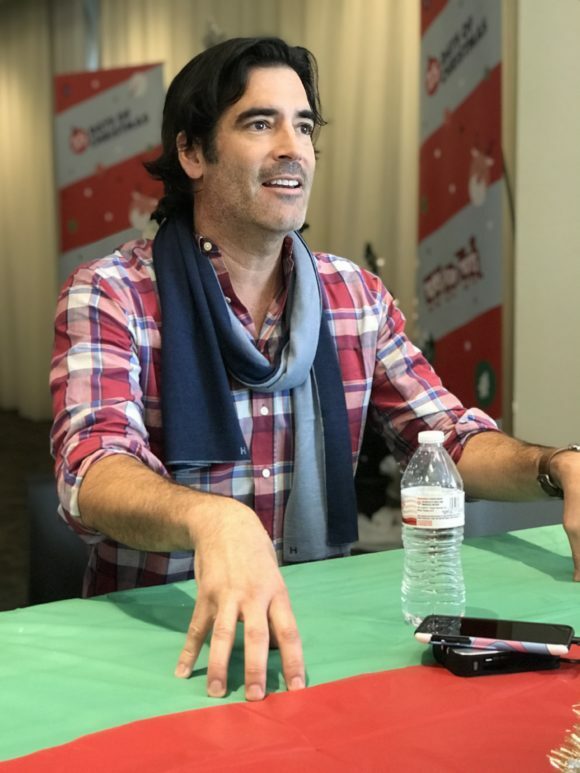 We interviewed Carter Oosterhouse, judge and host on The Great Christmas Light Fight during a 25 Days of Christmas holiday party. This season of The Great Christmas Light Fight will introduce us to a home with 4 million lights. Watch The Great Christmas Light Fight airs Mondays at 8|7c on The ABC Television Network or streaming or on demand. Finally, I want to encourage you to see holiday lights like some of my blogger friends see them. During The Great Christmas Light Fight interview, my fellow bloggers and I came up with a great idea. We’d collaborate on our holiday light stories with each of us sharing our favorite holiday lights and related traditions. See holiday lights through their eyes in their descriptions below. I love the light display at the Port St Lucie Christmas House. It’s located in my former neighborhood in Tradition. Jim and Jerome have been decorating for the past 11 years, upping their game year after year. Because their home is such an attraction, they now offer tours of the home (in & out). The house is SO festive, that it was featured on last weeks “Great American Light Fight.” While THEY may not have won the big prize, The Boys & Girls Club of Port St Lucie and Dogs & Cats Forever (our local no-kill shelter) is reaping the rewards of the toy drive and raffle they are running this year. Read more at champagneliving.net/port-st-lucie-christmas-house-a-holiday-tradition. We love our South Florida tradition of visiting the iconic Santa’s Enchanted Forest! It brings together a fabulous holiday light extravaganza that pairs up nicely with fun, rides, food and much more. It has been around for 36 years and started out as a family lighting a dark and isolated road by the highway! 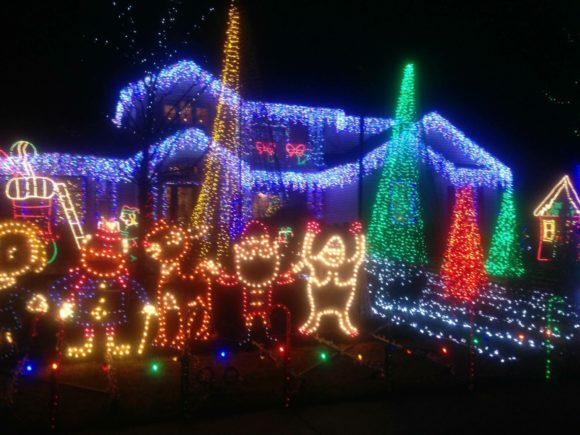 Great family fun that gets us festive and ready to go drive by neighbors with hunting for impressive light displays! Read more at coolmomscooltips.com/2017/11/tips-on-santas-enchanted-forest-park-for-first-timers.html. 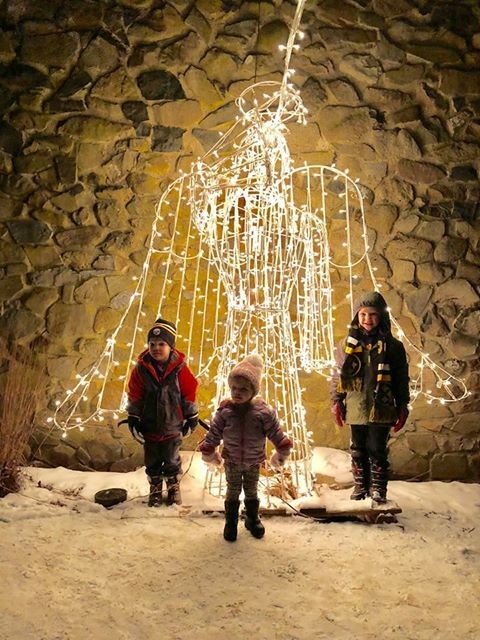 Our tradition is taking the grandkids out for dinner then grabbing hot chocolate to go, and head to Hubbard Park to drive through the amazing light display of animals. They even have a place to park so you can walk around the park, over the small bridges, and they have a small house to peek in the windows and see what the elves are up to! Read more at tools2tiaras.com. Photo Credit Rachel from Tools 2 Tiaras. It is wonderful to see neighbors get into the holiday spirit decorating their homes with amazing lights for all to enjoy. Our traditions is admiring our favorite lights of all which are at the most magical place on earth! Disney! Read more at www.couponMamacita.com. 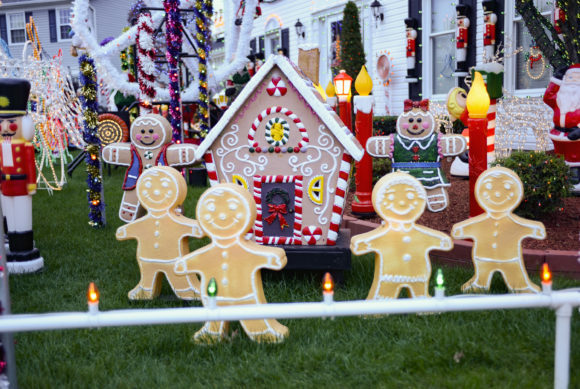 A neighborhood light display on Sooy Lane in Absecon, New Jersey. For me my favorite light display is a neighborhood light display on Sooy Lane in Absecon. My family and I have been checking out this local New Jersey Christmas light display for years. It’s just not Christmas without it. The family’s over-the-top display of lights started in 2006 and has grown every year. It spans not only the front year, but also the entire house, the side yard and part of an adjacent forest. They don’t charge anything for visitors but do accept donations for the Greater Atlantic Cancer Fund. Once they turn the lights on December 1, it’s a nonstop stream of cars driving by nightly until the lights go off on January 1. It’s definitely a site to see. What’s your favorite way to see Christmas lights?